The residents of Wrocław as well as visitors will be able to use Vozilla’s electric car rental service (charged per minute) from the first days of November. The company holds a fleet of 190 Nissan Leaf passenger cars and 10 VAN vehicles. Vozilla charges 1PLN per minute of the rental service. The rental service is going to follow free-floating principles. The first thing the customer has to do is download a special app and register in the service. The app is necessary for you to find the closest vehicle and book it with your smartphone. Then you may access the car where the previous user or the operator have left it. The rental service is provided across the entire administrative area of Wrocław. Users are allowed to leave Wrocław. However, to return the car you are also obliged to return to the city. You can leave your car at any generally accessible car park. 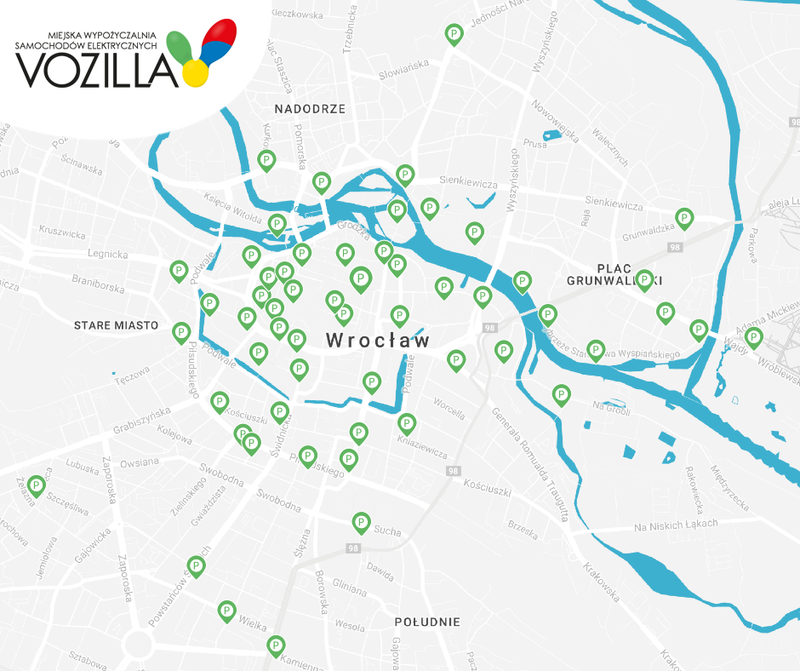 Vozilla is going to secure a number of additional privileges to the users, including 200 separate parking spaces in the very centre of Wrocław. The slots are a guarantee of free parking for Vozilla’s customers. Vozilla users will be able to check the availability of the spaces in their smartphones with a special mobile app which they use to rent and open the vehicle. No key is necessary to operate the vehicle. All you need to do to start the car is press a suitable button in the dashboard. Additionally, Vozilla’s cars are similar to cabs in that they are authorized to access bus lanes and zones with restricted access for combustion engine vehicles. Vozilla cars are authorised to use the following bus lanes: ul Reymonta/Pomorska, Podwale, Trzebnicka, Piłsudskiego, pl Teatralny, św Jadwigi, Traugutta, Jedności Narodowej, Szewska, Robotnicza. The service is going to cost 1 PLN per minute of the ride. Additionally, if the car is on hold, the service is payable 0.1 PLN per minute. “Our vehicles are authorised to use bus lanes for our users to save time and avoid traffic jams. Hence our transparent pricing. Our customers pay only for the time they use the vehicles. This is the best solution we can think of," explains Vozilla’s Manager Miłosz Franaszek. Vozilla’s vehicles can travel up to 250 km per one charging. While travelling in the city such as Wrocław, the battery should allow a range of ca. 150–160 km. Vozilla’s customers will be provided with a special app to check battery life before they enter the vehicle and the estimated range of the car.